Kaouar Oasis French Equatorial Africa-French West Africa. 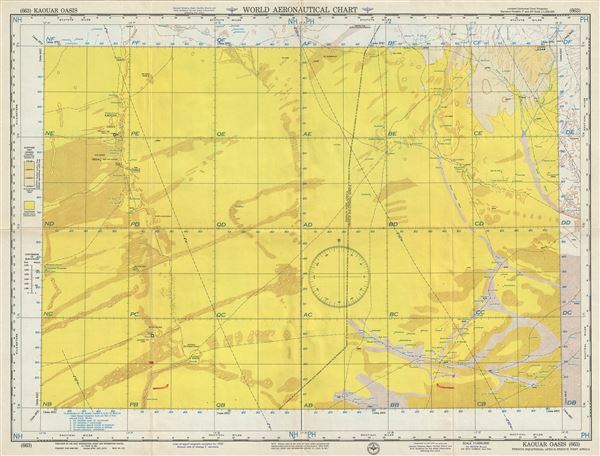 This is a fine 1954 U.S. Air Force aeronautical chart or map of the Kaouar Oasis in north east Niger. The map covers the region from Kaussa Arma north to Gouonega in Chad. The towns of Bilma, and Dirkou are noted. The map is highly detailed, noting communes, valleys, mountains, deserts, rivers, dunes, cities and other hydrographical and topographical features essential for the air pilot. Famous for the production of salt and dates, were part of the Bornu Empire and the Fezzan caravan route. Though mostly desert, 19th century Fezzan had numerous oases and supported a relatively large population. This desert kingdom was a critical stopping point for trade caravans crossing the Sahara since antiquity. Verso of this chart features legends and a world aeronautical chart index. This chart was published by the USAF Aeronautical Chart and Information Center and was issued as chart no. 663. First issued in 1948, this is the third edition revised to May 1954. Very good. Minor wear and toning along original fold lines. Minor spotting in red.